Aldo Leopold, an ecologist and the founder of the science of wildlife management, once wrote about the Sandhill Crane, "When we hear his call, we hear no mere bird. We hear the trumpet in the orchestra of evolution." The call of the Sandhill Crane will carry more than a mile, and can be heard across Tennessee as this majestic bird passes high overhead during migration, or when stopping in the state to spend the winter. The Sandhill Crane breeds from western Alaska through the Canadian tundra to the northern United States, with scattered populations in the west, and non-migratory populations in Mississippi and Florida. It winters in the southern United States and northern Mexico. This species was nearly decimated in the east by breeding habitat loss and over hunting in the 1800s, and is now making a comeback. Populations have increased over the last 60 years and we may now find over 20,000 cranes in the Hiwassee River area of southeastern Tennessee in winter with thousands seen from the Observation Platform. There's an estimated minimum 89,000 Sandhil Cranes in the eastern population that passes through and winters in Tennessee. The Sandhill Crane stands over 4 feet tall, with a wingspan stretching more than 6 feet, making it one of the largest birds found in Tennessee. Description: This tall, long necked, and long legged bird is overall gray, with a large tuft of feathers at the rump. The top of the head is red, which is actually red skin, and the cheek is a bright white. Young birds are overall mottled gray and brown, with a non-contrasting feathered head. Males and females look alike with the male somewhat larger. All species of cranes fly with their necks outstretched. Voice: The call is described as a trumpeting, or bugling, or a resonating, wooden rattle, which can carry long distances. Mated pairs of cranes engage in "unison calling," where the cranes stand close together, calling in a synchronized and complex duet. The call of young birds can be easily distinguished and resembles a musical purr. Whooping Cranes in their first year may be confused with Sandhill Cranes, but usually have some white below, not gray. Adult Whooping Cranes are overall white with black wing tips. Whooping Cranes are rare in Tennessee, but are often found in the same fields with Sandhill Cranes. Great Blue Herons are smaller, have no red on the head, and fly with their necks curled against the body instead of straight out. They are generally solitary in winter and usually forage close to water. Sandhill Cranes typically occur in flocks with a few to several thousand individuals in winter. Habitat: Migrating and wintering Sandhill Cranes are found in wet grasslands, marshes, and grain fields. Diet: Cranes are omnivorous, eating seeds, berries, cultivated grains, insects, and small mammals from the surface of the ground as well as probing into soil and mud. Nesting and reproduction: The Sandhill Crane is a long-lived species (20 years or more) and does not successfully breed until 5 to 7 years old, and has one of the lowest reproductive rates of any bird in North America (only one nest in 3 produces a chick that survives to migrate in the fall). Interesting fact is that they mate for life. Clutch Size: Ranges from 1 to 2 eggs. Incubation: Males and females incubate the eggs for 29 to 32 days. Fledging: On average, less than one chick is produced per nest. Young birds forage, roost, and migrate with their parents, usually staying within a few meters of them, for 9 to 10 months. Status in Tennessee: The Sandhill Crane is an uncommon migrant and locally common winter resident in Tennessee, though numbers appear to be increasing. Fall migration lasts from late October to late December and spring migration is from mid-February through late March. A few thousand cranes have also been wintering at Hop-In Refuge in Obion County, and over ten thousand on and around the Hiwassee Refuge in Meigs County. 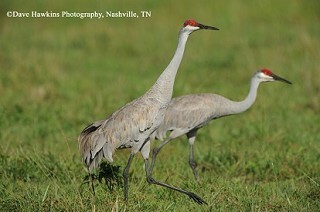 Sandhill Cranes only started wintering in Tennessee in the 1990s. The only historical observation of Sandhill Cranes during the winter in Tennessee is from an observation reported by John James Audubon in November 1820 of a large flocks of cranes in the vicinity of the Shelby/Tipton County line. There are 6 subspecies of Sandhill Cranes in North America. It is the Greater Sandhill Crane, Grus canadensis tabida that migrates through and winters in Tennessee. The oldest known Sandhill Crane was 36 years 7 months old. A Miocene crane fossil, thought to be about ten million years old, was found in Nebraska and is structurally identical to the modern Sandhill crane, making it the oldest known bird species still surviving! Tacha, T. C., S. A. Nesbitt, and P. A. Vohs. 1992. Sandhill Crane (Grus canadensis). The Birds of North America, No. 31 (A. Poole, P. Stettenheim, and F. Gill, Eds.). The Academy of Natural Sciences, Philadelphia, PA, and The American Ornithologists' Union, Washington, D.C.